Love the concept - easy to de-power downwind and should be able to angle the foil like a kite-foiler upwind? Can you jump and fly? Don't let go of the boom !! Reminds to much of a kite.l pass on that one! I think its funny how Naish always acts like he's the first while most of the time he is definately not and (my opinion) more often than not doesn't have the best worked out version of things. Fanatic is on to it as well? So much effort with the wing. I wonder how much wind this thing needs and if it could replace my 7.2 sail? As someone pointed out elsewhere, it's going to be difficult to see downwind. I wouldn't mind giving it a go depending on the price. Something different that could be a laugh. When I used to waterski we attached the rope to the front of a ski just to see if it would work. Turns out my mum was the only one that could do it properly. 4 - If I can look cool (sausage-ring notwithstanding) doing it... then this old windsurfer is IN! Where can you buy one of these wings in Perth WA, and how much? It would open up so many areas inland to sail, looks good. That just looks like hard work, all arm work no harness and bugger all leverage for control. There's nowhere near the load of a windsurfer sail of kitesurfing kite so it shouldn't be that bad. Having said that I wouldn't be surprised to start seeing a harness being used with them. I think it looks like a bit of fun :). I don't think you would need a harness, as the power you need (when on the foil) , is so little. Paired with the right foil / board. 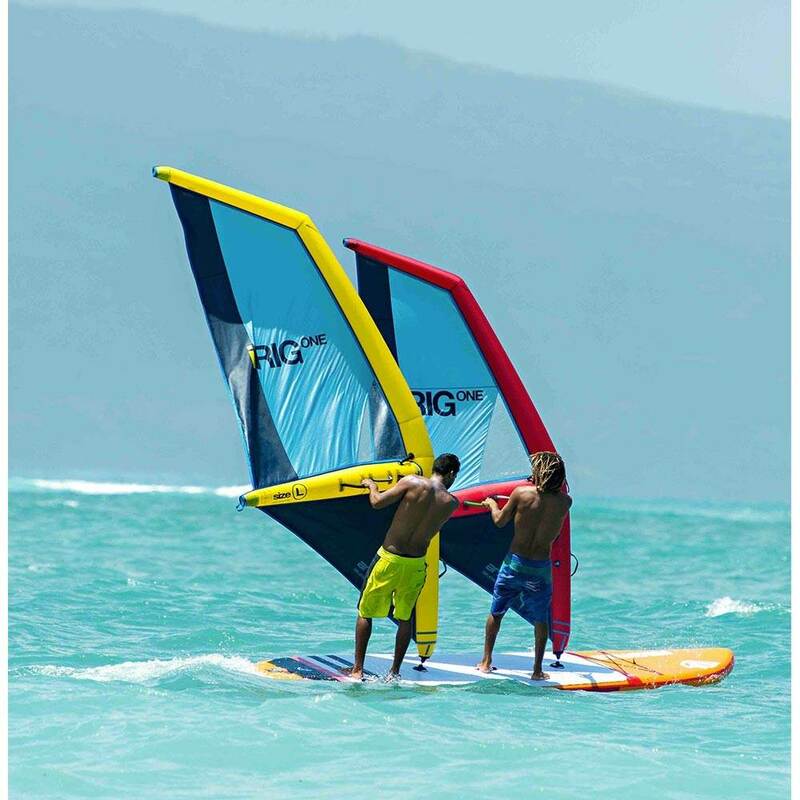 We already require so little power to get going on the more lifty foils (freeriding / fun foils) on the wind foil boards. Think it just have to bee seen as a potentially fun 'add on', to the Wind foiling / Kite foiling / SUP foiling. I wonder how the pricing will be? Also I wonder about the size of board to use? Yeah agree, a nice simple light wind option. I hope it works. It'll be good to not have to rig up a sail. How are you supposed to hang onto it for extended periods. It's weird! Cumbersome. I'm not sold. 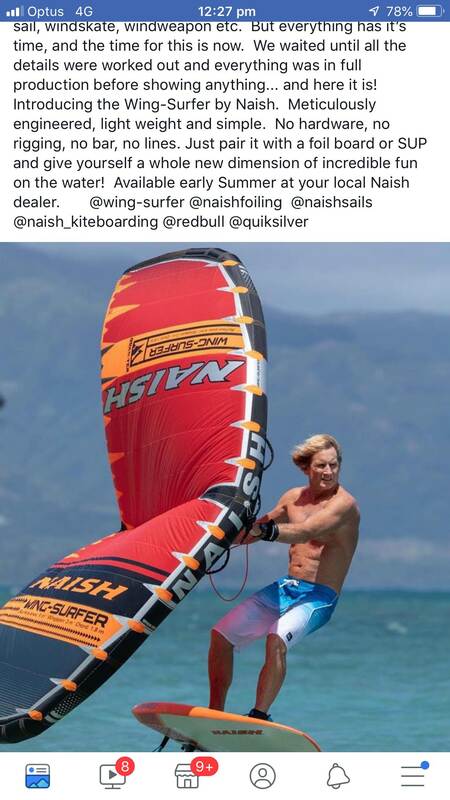 Any footage of Mr Naish in action on it? If this catches on we could try joining the wing to the board ... it would be a whole new sport. Don't think it's gunna be a light wind option, All the videos I've seen so far (from all brands) have been in really decent wind , can't see how they're gunna make bigger sizes than the 3 metres for lighter wind and not be hitting the water with the bottom of it as your holding it in the middle. 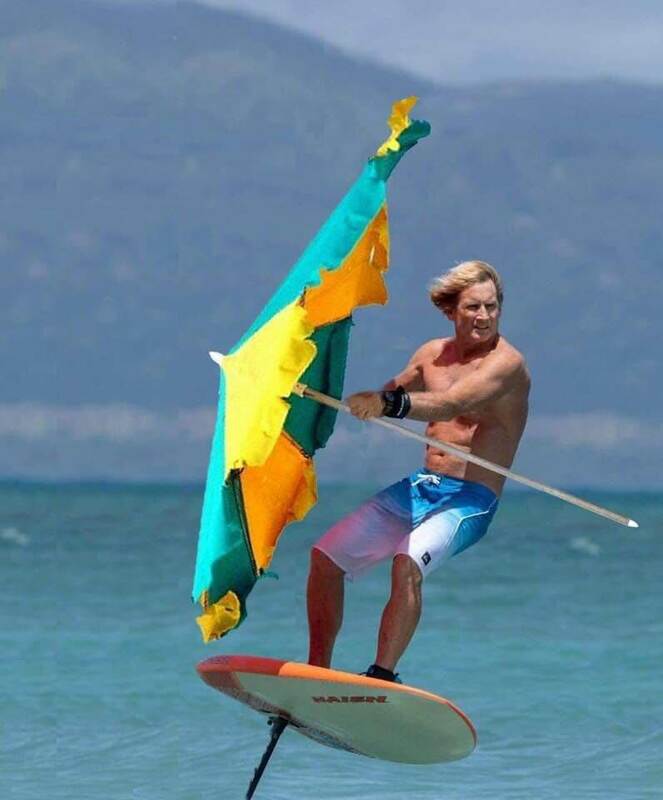 See Kai Lenny on the ozone one it nearly gets ripped out of his hands hitting the water a few times and that looks smaller than the Naish. I agree with Jesper - it could be a great option with big high-lift foils when downwinding ocean windswells. Looks like it might be easy to depower so we can just ride the swells. The largest ones need 25kts and that's for the 70kg riders.